Thrombosis of the internal jugular vein is a relatively rare condition that can be induced by a variety of mechanical injuries.1,2 Acupressure, or “shiatsu”, is an oriental massage technique and many acupoints on the body surface, known as “tsubos”, are used for shiatsu. Shiatsu of tsubos in the nape of the neck is known to improve tension headache due to neck and shoulder aches. However, we recently came across a case of internal jugular vein (IJV) and cerebral sinus thrombosis after shiatsu massage of the neck. A 35 year old man, a non-smoker, was suffering from a stiff neck. He consulted a shiatsu masseur, who performed shiatsu massage on the right side of his neck and right shoulder for 30 minutes. Immediately after the shiatsu massage, the patient noticed pain and swelling of the right side of the neck, both of which subsided within seven days. Two days after the shiatsu massage, he developed a severe, constant right occipital headache and consulted his attending physician. His cervical radiograph was normal. The patient continued to have severe headache, however, and on the seventh day after the massage, he developed blurred vision. On the twentieth day, he developed weakness and paraesthesia of his right arm and leg, and mild agraphia for kanji characters. When he also developed focal motor seizure, he was admitted to our hospital. He underwent a neurological examination on the twenty third day after the shiatsu massage. The patient did not have any history of recent trauma, dental procedures, or upper respiratory infection. There was no history of any other relevant medication including homoeopathic or herbal medicines, or pathologic conditions. There was no family history of premature stroke or thrombotic events. Physical examination was normal and no neck mass was detected. On neurological examination, he showed normal consciousness and orientation. Funduscopic examination revealed bilateral papilloedema without haemorrhage, but the remaining cranial nerves were intact. He had mild muscle weakness and sensory deficit in the right arm and leg. Ataxia was not detected in any of the limbs and trunk. Mild agraphia for kanji characters was observed. Laboratory analysis showed prothrombin time, partial thromboplastin time, antithrombin III, protein C, and protein S were normal, but values for anticardiolipin antibody IgG and lupus anticoagulant were negative. Plasma homocysteine was within normal limits. Autoantibodies and cryoglobulins were absent. No evidence of any systemic disease was found on investigation. Cerebrospinal fluid was clear without pleocytosis, but the cerebrospinal fluid pressure was 350 mm H2O. Magnetic resonance imaging (MRI) scan of the brain showed infarction with haemorrhage in the left parietal lobe and an area of increased signal intensity in the area of the right transverse and superior sagittal sinuses (fig 1). In addition, MRI of the neck with and without enhancement revealed thrombosis of the right IJV, starting from the junction with the right subclavian vein (see fig 1). However, there were no structural abnormalities adjacent to the right IJV, and the carotid arteries were normal. Digital subtraction venous angiography confirmed extensive thrombosis in the right IJV, the right sigmoid sinus, the right transverse sinus, and the superior sagittal sinus (see fig 1). The rest of the intracranial dural sinuses were patent, and no vascular malformation was detected. 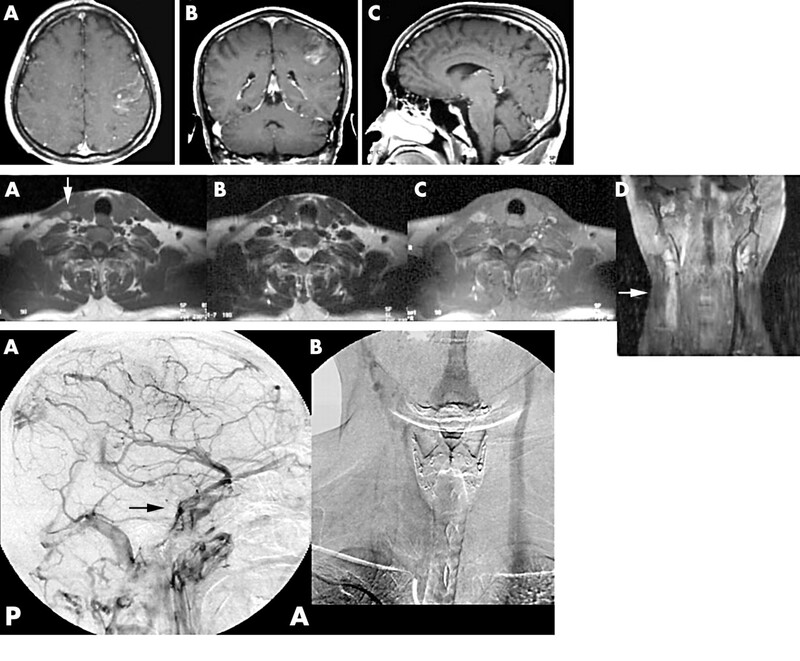 Top panel: post enhancement T1-weighted magnetic resonance (MR) image of the head (A) axial, (B) coronal, and (C) sagittal. (A) and (B) show the left parietal haemorrhagic infarct. The superior sagittal sinus and right transverse sinus show high intensity signal within the lumen instead of the normal “flow void”, indicating thrombosis. Middle panel: MR image of the neck (A) T1-weighted, (B) T2-weighted, (C) post enhancement T1-weighted, and (D) coronal T2-weighted showing right internal jugular vein thrombosis without other structural abnormalities (arrows). Bottom panel: digital subtraction angiogram (A) lateral view of the head during the early venous phase of right carotid digital subtraction angiography confirms the non-opacification of the superior sagittal sinus, the deep cerebral venous system and the transverse sinuses. The predominant venous drainage is via the sphenoparietal sinus (arrow). (B) Anteroposterior view of the neck—the right jugular vein had an area of obstruction at its junction with the right subclavian vein. Phenytoin and valproic acid were promptly administered resulting in improvement in the patient’s focal motor seizures. He was also given heparin and warfarin and the intracranial hypertension was treated with a lumboperitoneal shunt. The headache and papilloedema slowly improved over the next three weeks, after which the patient was discharged. Neurological examinations over the past several months have revealed only mild clumsiness and paraesthesia of his right hand and leg. Our patient started complaining of a swelling and pain in the right side of the neck immediately after the shiatsu massage of the neck. Subsequently, over a period of about a month, he developed progressive headache, right extremity paralysis, papilloedema, and partial seizures. Although it may be coincidental, the possibility of a causal link between the shiatsu massage and IJV thrombosis is supported by the patient’s claim of a massage induced swelling and pain in his neck, and by the temporal relation between the massage and the onset of symptoms that progressed to IJV and cerebral venous sinus thrombosis. It is difficult to determine the exact mechanism of the IJV thrombosis in our patient. One possibility is that direct trauma or pressure may have induced both venous stasis and vascular injury during the shiatsu massage. The other possibility is that extrinsic compression of the IJV by tissue swelling subsequent to trauma during the shiatsu massage may have induced venous stasis, resulting in thrombosis at this unusual site. Various forms of trauma have been reported in association with IJV thrombosis, such as jugular thrombosis after catheterisation1 and Glisson traction for the neck.2 To the best of our knowledge, IJV and cerebral venous sinus thrombosis possibly caused by shiatsu massage has not been previously reported. Our case may thus represent a newly identified traumatic aetiology. Chiropractice is a popular alternative therapy in Western countries, and there are several reports of a relation between chiropractic manipulation and stroke.3 Shiatsu massage, an oriental technique of massage, is a popular alternative therapy in Japan and other Asian countries. Recently this therapy, including the use of a mechanical shiatsu-type massager, is becoming increasingly popular in Western countries. In addition, it is generally accepted that this technique is risk free. However, there are two other reports of vascular complications following shiatsu massage in the literature.4,5 Tsuboi4 reported a case of retinal and cerebral artery embolism directly caused by shiatsu massage of the neck. Elliott and Taylor5 also reported two cases of carotid dissection that occurred after use of a shiatsu-type massaging machine. We would therefore like to draw attention to the possibility that shiatsu massage of the neck may cause serious neurological complications. Larkey D, Williams CR, Fanning J, et al. Fatal superior sagittal sinus thrombosis associated with internal jugular vein catheterization. Am J Obstet Gynecol 1993;169:1612–14. Simmers TA, Bekkenk MW, Vidakovic-Vukic M. Internal jugular vein thrombosis after cervical traction. J Intern Med1997;241:333–5. Peters M, Bohl J, Thomke F, et al. Dissection of the internal carotid artery after chiropractic manipulation of the neck. Neurology 1995;45:2284–6. Tsuboi K. Retinal and cerebral artery embolism after “shiatsu” on the neck. Stroke 2001;32:2441. Elliott MA, Taylor LP. “Shiatsu” sympathectomy ICA dissection associated with a shiatsu massager. Neurology 2002;58:1302–4.